It’s fall, my favorite season in Michigan!! That means it’s the start of Comfort Food Season – yay! Time to give the slow cooker residence on the kitchen counter for the next six months and fire up the oven for slow roasting large hunks of meat and baking cinnamon spiced (gluten-free) treats. Yes, this is my happy place. 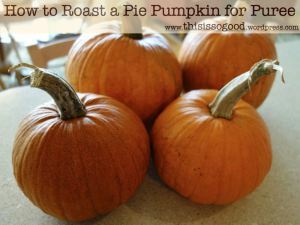 So I know there are thousands of tutorials on roasting pie pumpkins for puree. Why am I throwing another one out there? Hmm…why not? This method works for me and better yet, it’s really easy! Equipment required is minimal and pretty basic – a sheet pan, parchment paper, a large knife and cutting board, a spoon, an oven, and a food processor or heavy duty blender. The food processor may not be in everyones kitchen, but don’t fret, I will give you other options! Just one Oatmeal Cookie…no flour!